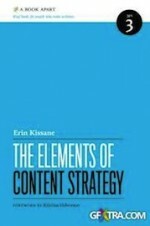 The Elements of Content Strategy is in many ways the suite to Kristina Halvorson’s Content Strategy for the Web. While the latter highlights the core strategy and its components, Erin Kissane tackles the subject head on with methods, what she calls “a collection of principles, goals, approaches, and tools“. The end result hopefully being the publication of “good content” which according to Erin is useful, user-centered, clear, consistent, concise, and supported. There is no question, all web sites could use a content strategist to oversee the content planning and implementation. Though most companies I know cannot afford to invest in new and competent personnel to manage content, Erin makes a compelling case as to why this is an investment that would reap valuable returns. What makes good content though seems so simple, yet is nevertheless borderline impossible without content strategy. I am not here, though, to give you a review of this ebook. You can find numerous articles on the web. For a start, check out Tom Johnson’s book review at I’d Rather be Writing. Rather, the question is how can we introduce content strategy to our clients when deadlines and functions monopolize the conversation? It’s a recurrent problem, and most of my clients in the end struggle with getting the content out the door. Let alone getting it right. Projects are regularly delayed as we wait for the content to trickle in. Worse, the design has to be rethought late in the project lifecycle because new content just won’t fit in. It’s evident for everyone we have to start with the content, but it’s easier said than done. Most of my clients, and I don’t think I’m alone, do not have a content strategist. The Elements of Content Strategy has been helping me rethink the beginning stages of a web project. The content templates Erin gives allow us to situate the priorities, the benefits, the proper lexicon, even the word count. But can I help them thoroughly, when this is not part of the client culture? The other day I met with a client having this very problem, Sunny French Property. They are a small real estate company, looking to attract potential UK (or elsewhere) customers to purchase a new home in France. They are just two people, playing all the roles: editor, curator, marketer, and info scientist, not to mention realtor. Does that seem outrageous to you? Maybe, but it sure is a common reality. This particular company chose to work with us to build a web site that doesn’t just sell homes, but rather a dream to live in South West France. Just having finished The Elements of Content Strategy, I felt it appropriate to launch into a discussion on revising their content. Though the site has been online for a couple years, it’s never too late to try to get it right. Titles were long, some reaching 20 words. Titles included prices and too many adjectives. Our goal is to move from a text that could be for a tourist office, to more of a business and real-estate vocabulary. It helps in these situations to think about the personas. Without going into detail, one such profile could very well be a high-end income family, looking to add to their family heritage a second home and is attracted by a better climate in the south. Transversal content: links to similar residences. Body Within walking distance (500 m) to a 3 miles fine sand beach and on the fringe of a vast preserved area of Mediterranean Guarrigue, this intimate gated residence of just 23 apartments in modern and airy architecture offers 1 to 4 bedroom apartments with vast terraces (10 to 17 sqm) or private garden for ground floor apartments.Apartments are reasonably priced and have slightly above the standards sizes whereas seaside apartments usually tend to have below standard sizes.The development is classified BBC (Bâtiment Basse Consommation) which complies with the stringent future thermal regulation RT2012 that will be implemented as of 2013 and ensures lower energy costs.Interior specifications are refined and a possibility to personalise your apartment within 3 different styles imagined by an interior designer is provided at no extra cost. All apartments have at least one allocated parking space with a possibility to buy one garage and one cellar. The building is 3-storey with a lift which makes it suitable for persons with impaired mobility.The location offers the very rare advantage of being within walking distance of both a very long beach and a vast and hilly protected wild area planted in all type of Mediterranean vegetation inhabited by cicadas only. Live next to the Mediterranean Sea and the Garrigue! This gated residence offers 1 to 4 bedroom apartments for sale. Each apartment will be built in modern and airy architecture with vast terraces (10 to 17 sqm) or a private garden for ground floor apartments.If you are looking for an intimate living experience (only 23 apartments in this gated residence), while within walking distance (500 m) to the beach, then these apartments should be considered.Choose from 3 different styles imagined by an interior designer, provided at no extra cost. Parking included and possibilities for garage and cellar extensions.If you are ready to buy or just need a little more information, contact us. We’d love to hear from you. Our opinion (added value) Few places on the Languedoc coastline can boast such a blessed geography as Narbonne-Plage: nestled between a long sandy beach and a vast natural protected area planted in garrigue. This comfortable and high quality specifications development will enable you to enjoy this quintessence of the Mediterranean lifestyle. We love the comfort and high quality living standards offered by the residence. Further, few places on the Mediterranean shore can boast such a beautiful geography as Narbonne-Plage: nestled between a long sandy beach and a vast natural protected area planted in the garrigue. Transversal links None Links to other residences on the mediterranean shore from Perpignan to Nice. If only we had done this at the beginning. In any case, a very motivated client continues to update and improve their content. Focused on content that is user-centered, but also consistent and adhering to SEO objectives. We now start to come up with content much easier to manage and much more intuitive. The question is: can we do this with efficacy at the beginning of the project, in spite of the obstacles? We’ll start by helping the client put together content templates, setting up content iterations that match those of our creative team. And we will reinforce the collaborative methods (client, creative, development, seo), because working from point to point in a linear way just doesn’t work. This ebook is extremely practical, which is what we need more and more as the web industry gets more mature. And besides offering insight into the methods to running content strategy, Erin also serves up plenty of resources to go further.